It is the Price that is announced by the government especially to support and protect the farmers/Producer. When there is an excessive & abundant supply of commodities i.e glut in market, the demand of the commodity goes down . The Producers when comes to market for selling, fails even to recover even the input cost . Under such conditions , MSP provision as kept by government comes in to play . As per MSP provision, the government Purchases the Commodity/Produce at a pre announced price and prevent the price of the commodity/produce to go below an optimum level . Once before kharif sowing season , other before Rabi sowing season. Central govt. purchase it through Food Corporation of India(FCI) and other central agencies. Minimum Support Price(MSP) -A big Question ? If the govt. don’t have significant/adequate numbers of stock/ware houses to purchase & collect the produce of the farmers , Then what’s the use of announcing MSP and that too some time, with a hike . 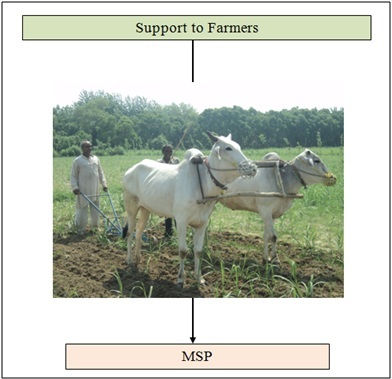 Minimum Support Price(MSP) -How can it be more effective?